As a devotee of complementary therapies, I loved this book. It offers an overview into how these three complementary therapies integrate with modern healthcare, and will be useful for anyone who wants to learn more about the therapies available, how they work, their evidence base and how they can be incorporated into treatment in the NHS. As a former cancer lead in a large district general hospital, I had not considered how to store essential oils, nor would I have thought of not giving the same attention to the storage of paracetamol. This book offers advice on governance issues, infection control (such as whether a therapist should wear gloves when performing a massage), documentation and confidentiality. 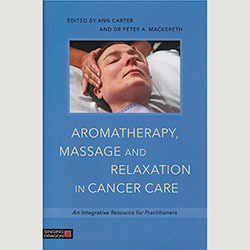 There is also a detailed explanation of how aromatherapy and massage work. Much of the application focuses on symptom management, palliative and end of life care. I recommend this book to anyone involved in cancer care and management.